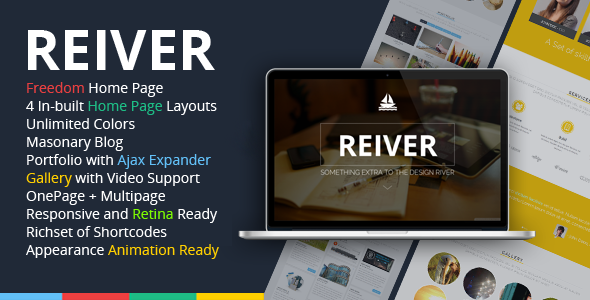 REIVER is easy to use cleanly designed fully responsive One Page template. This template is really easy to use and edit, you can easily manage theme prominent colors by Theme Options. You can set background colors for pages and ‘Page sub-sections’ on the go. This theme features Page Sub Sections , a unique feature that allows you to create a sub section for every page you have created, both on ‘One-Page’ and ‘Standalone Mode’. Item Reviewed: REIVER - WordPress One Page Responsive Portfolio 9 out of 10 based on 10 ratings. 9 user reviews.